Mary and her husband/Saxophonist Craig Durst, have been teaching in Glendora California for thirty five plus years. 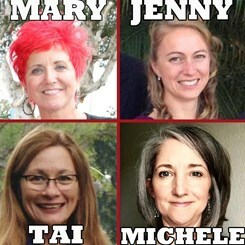 They currently have a team of five other teachers that teach with them. If you'd like to study under their direction please make that request! Jenny La Polla - Piano twenty plus years teaching with Mary. Michele Garcia - Michele has been a piano teacher and professional musician for most of her life. She has years of experience as a pianist and keyboardist, both as a solo player and as an accompanist for vocalists, instrumentalists, cover bands and theater. She has technical experience with midi and audio recording, having provided background tracks for several high school musical theater productions. She also has been a part of several worship teams at various churches in California and Texas. Michele and her husband George currently live in Corona, California. Mary grew up in Michigan studying classical music. Her parents were pastors and she learned to improvise with gospel music. After time at Huntington College in Indiana, she moved to California and hit the So Cal Rock and Jazz scene. She also studied at Azusa Pacific University and Cal Poly Pomona. She's written hundreds's of jazz and gospel tunes. Six of her original smooth jazz tunes hit the top 40 charts between 2001 to 2007, including spins on 94.7 The Wave radio, and has written more than eight albums. She currently gigs with her husband & Saxophonist, Craig Durst in their band 2AZZ1, along with her teaching residency at Pasadena City College. She developed a jazz vocal program that includes combo bands & music theory. Along with their concert career, Mary and her husband Craig have been the worship pastors at Light and Life Christian Fellowship for more than twenty six years in Long Beach CA. They've produced several contemporary worship albums, and continue to lead and raise up new bands and leaders. Mary loves to see the progress and success as musicians grow.